JNU students who are allegedly involved in the Sedition Case are reportedly surrendered before the Delhi Police at midnight. Times of India has reported that “Umar Khalid and Anirban Bhattacharya left the university campus and entered a JNU security van. Cops were waiting for them inside the van, which then drove around Vasant Kunj and RK Puram in a bid to dodge the media”. Yesterday Delhi High Court has refused to grant interim protection from arrest to JNU students Umar Khalid and Anirban Bhattacharya, asking them to surrender and follow the due process of law. “You can’t use your whim and fancy. You have to follow the procedure, surrender or arrest. You have to be produced before a magistrate and he will decide whether you go into police custody or jail,” Justice Pratibha Rani was quoted as saying. The Court asked the students to write down a name and place for their surrender, as well as mention the name of the lawyers who would assist them during the surrender process. The Delhi Police however raised a strong objection to Mr. Khalid’s suggestion that they be allowed to surrender at an undisclosed location and time. The DCP and the petitioners’ lawyers were then called to the Judge’s chambers for a closed hearing. Earlier today, a Bench comprising Justice B.D. Ahmed and Justice R.K. Gauba had agreed to hear the two students’ plea, seeking security before surrendering on Court orders. They had demanded an urgent hearing, contending that there existed a threat to their lives. Representing JNU students, Advocate Kamini Jaiswal reportedly contended before the Court that the students had to file the surrender application due to “exceptional circumstances” having been created. They referred to last week’s attack on JNU teachers and students, media personnel, and Mr. Kumar inside the premises of the Patiala House Courts by lawyers. They claimed that they feared a repetition of the incident, in case they were taken to the Patiala House Court. Five students have been accused of sedition in connection with an event organized in JNU against the hanging of Parliament attack convict Afzal Guru. 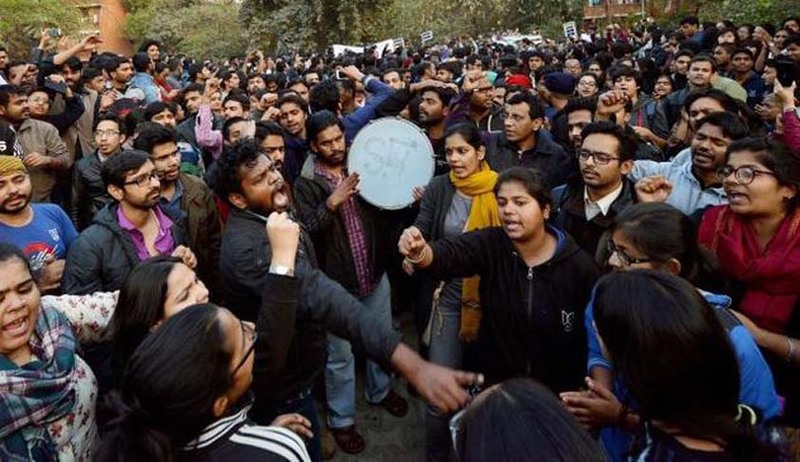 The students returned to the University on Sunday night, after they had gone missing from the campus since February 12 after JNUSU President Kanhaiya Kumar was arrested in the sedition case. While Umar and Anirban have sought protection, the three others have approached the Court seeking anticipatory bail. The High Court also adjourned Mr. Kumar’s bail application for Today, with Justice Pratibha Rani issuing a notice to Delhi Police, asking it to file a status report on the probe by Wednesday morning. As reported by Indian Express, it was contended by Additional Solicitor General Tushar Mehta that since it was a pre-charge sheet bail application, the police should be allowed to file the status report in a sealed cover. The bench, however, rejected the request, commenting that, “It’s just a bail application and the petitioners have the right to know.” The Court also directed a copy of the status report to be given to Mr. Kumar’s counsel, Rebecca John.